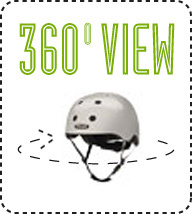 MELON® Urban Active Helmets – Breezy, lightweight and more. Melon is style, fun and function, we offer more then just design. The latest production technologies and a wide range of features provide all the requirements for a modern, urban, active application. The hi-tech in-mold construction in a classic shape, make it 30% lighter, to comparable hard shell helmets. 3 base sizes are available, each adjustable further through Coolmax® pads and adjustment system, cover a range from 46-63cm. 12 air inlets, air channels and a Fidlock® magnetic buckle offer class leading comfort. Unique extra: Vista Visor available in 6 colours giving UV400 protection.